As a for-profit organization within the Alexandria Chamber, Lakes Area Marketing, Inc. (LAMI) focuses on marketing the Alexandria Lakes Area. Volunteers from local lodging facilities work together to promote the area with numerous effective marketing tools bringing visitors to the area year-round. The most visible of these tools is the ﻿Alexandria Area Visitor and Livability Guide﻿. Members also attend a variety of sport shows promoting the Alexandria Lakes Area. Overall, LAMI advocates for the economic well-being of the local lodging industry, while maintaining a strong lodging presence that is vital to the area and to the state tourism industry. Click here to download the LAMI brochure. ​The Visitor and Livability guide is published annually to promote the lakes area as the ultimate destination to vacation and live. 47,000 copies of the guide are distributed locally through the Chamber Visitor Center and area businesses, regionally at sport shows, job fairs, and area travel centers, and mailed upon online and phone requests. 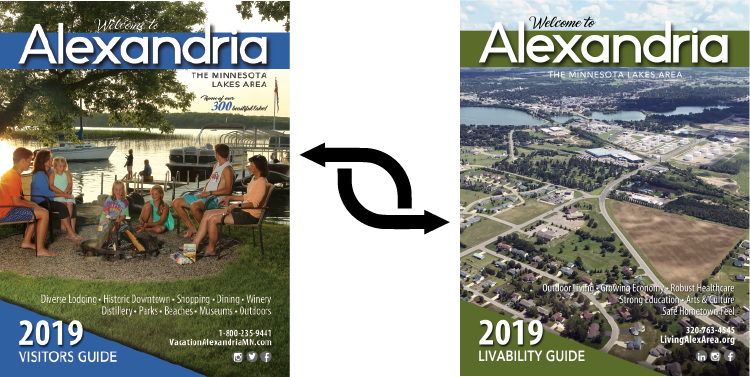 Click here to request a 2019 Visitor and Livability Guide!